washington fly fishing: It's Chum Baby Time! . . . Again. It's Chum Baby Time! . . . Again. 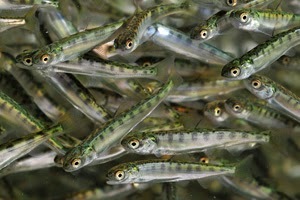 March on the north Olympic Peninsula rivers is peak spawning time for most of our sea-run Coastal Cutthroat trout. So it's no surprise that we don't see very many of them on the beaches right now. With the milder winter we have had this year it is likely that most of them have already spawned and some are well on their way to the salt. But by April they will be showing up in greater numbers up here, chasing the juvenile Chum and Pink salmon all over the place, and fattening up. And it doesn't hurt a bit that last year we had some very strong runs of these salmon returning to our watersheds to spawn. For the last month or more the regional biologists and technicians, using smolt traps, have been counting the out migrating fry as they move out of the gravel redds and down to the estuaries. This will continue for many weeks to come here. And just about the time that the post spawning Cutthroat, and some of their younger brethren, have dropped out of the rivers and streams, down to the estuaries and shorelines, the Chum and Pink salmon juveniles will be well distributed in the same places. The Cutthroat will be feeding with reckless zeal. These fish, both predator and prey alike, have evolved through this dance over many tens of thousands of years here. As fly fishers it behooves us to learn about these things. Now is the time! This fly is also doing well up in Alaska, on the early season Lake Iliamna tributaries and Katmai National Park region Rainbows and Char, Grayling etc., that are feeding on fry and smolt in the rivers. And now some of my whacko smallmouth bass fishing buddies are cleaning up with the Chum Baby fly on the rivers and lakes too. So we are discovering that this fly has some application beyond the shores of Puget Sound country. You should be using this fly anywhere that the big fish eat the little fish! Dozens of Chum Baby flies have once again migrated across Puget Sound, over the I-405 Bridge, and all of the way upstream to the Orvis Bellevue Fly Shop! If you are in the Seattle area, drop in to the Belevue Orvis Shop! Tie your own Chum Baby flies! If you would like to tie your own Chum Baby flies, from my original pattern and written instructions, I will be happy to provide two sample tying model flies, tied by myself, and the written instructions. We will be back on the water by mid to late April this spring, just in time for the beginning of another beautiful season of wild sea run Coastal Cutthroat trout fly fishing on the saltwaters of the Olympic Peninsula, Hood Canal and Puget Sound. Drop me a note or give me a call for details.